visto che i miei gusti somigliano molto ai tuoi penso proprio che adotterò questo trend! This photos is adorable. I love the heart shape trend, so perfect for sunglasses. This off shoulder blouse is very pretty as well. 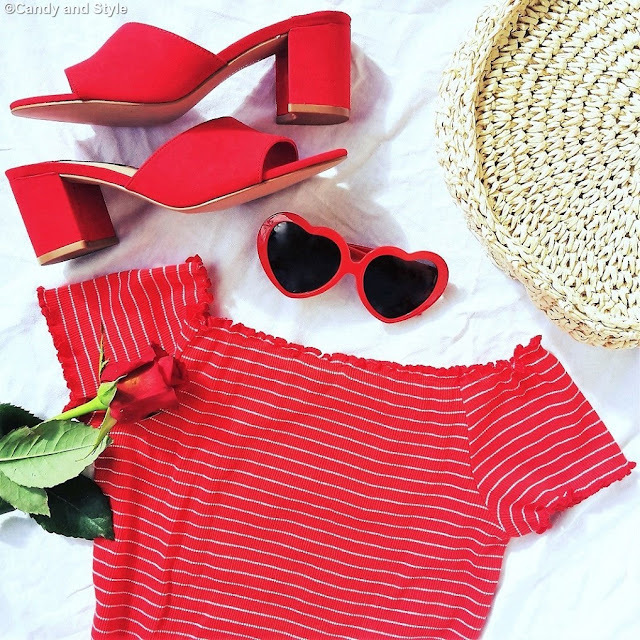 The red sandals are super cute. E' un trend davvero bello,dovrò trarre ispirazione. And the heart sunnies look so fun to wear. Have a fantastic week dear Lilli. Smocked style tops are so pretty and stylish. I like the colour red for summer too. I love this trend so much! it's just too cute to avoid.